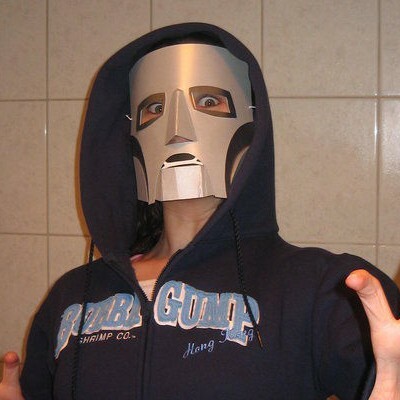 Here's a simple yet stylish Doctor Doom mask from Courtney at Instructables.com. The mask is constructed using black, grey and silver cardstock. No color printing required! The template for the mask is available here. Doctor Doom, as you may know, is a super villain in the Marvel Comics universe who has gone up against the likes of Spider-Man, the Avengers and the X-Men. 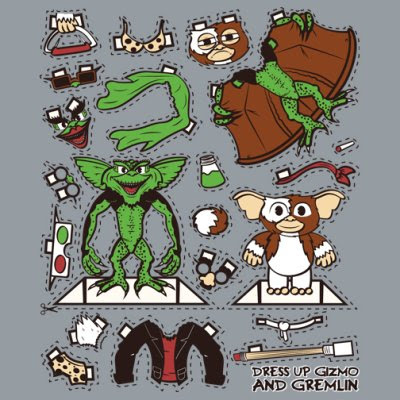 These Gremlins cut outs by UK illustrator Hoborobo were originally a T-shirt design but that doesn't stop them from being used as real paper dolls. The props that come with the dolls are those used by Gizmo and the evil gremlins in the two Gremlins movies. A JPG of the dolls may be downloaded here. 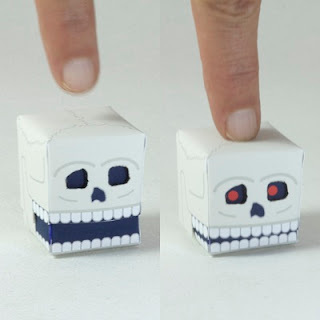 Build a robot action figure at home! All you need is a printer, an X-acto knife, tape (double stick tape works better), and two flexible straws! ...real posable arms and legs! Eight points of articulation! Wow! 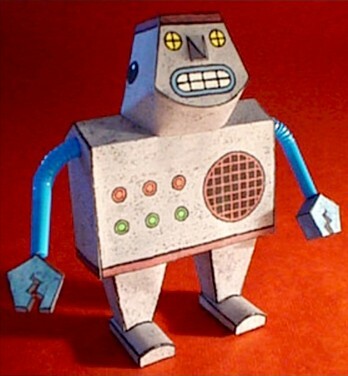 Andy's paper toy matches a robot character in a book he wrote. The template is available here. 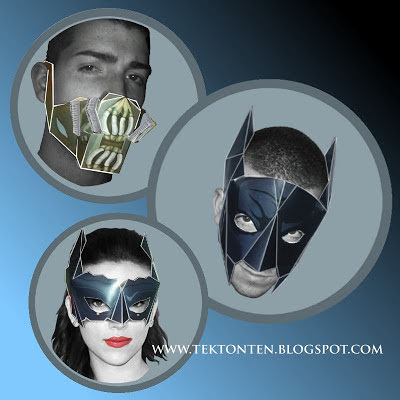 These Dark Knight Rises masks by Patrick Sullivan were recently featured on Vulture.com. The thing I like about these masks is their simplicity. Each one is a single piece that is folded and taped to form the mask. But alas, there is a catch. The masks require 11" x 17" size paper which is too large for many home printers to handle. To make printing easier for myself I split each template into two letter size (8.5" x 11") parts that can be taped together. Links to copies of the split templates are listed below. This Scooby Doo paper model falls in the category of "oldie but goodie". 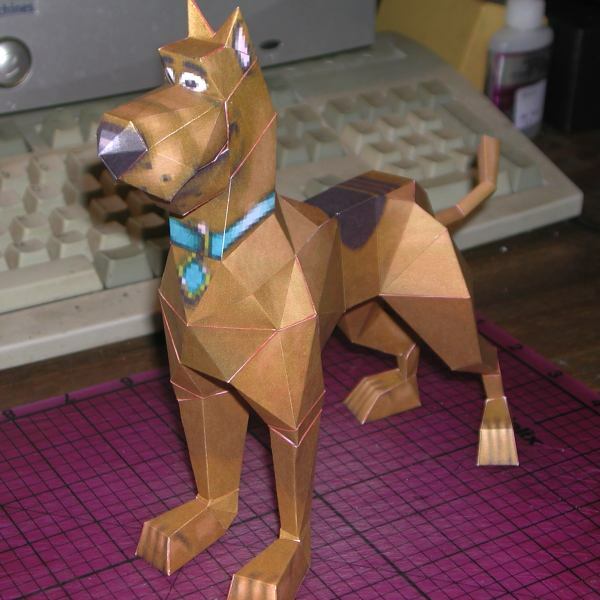 Released in 2008 by Guillermo Molina on the now defunct Bongo Papercraft blog, the familiar pooch was part of a series of papercraft Scooby Doo characters on which Guillermo was working. Templates for the characters are hard to find these days, but Scooby at least is still available here. The build photo above is by Josh at Sidewinder's Model Works. UPDATE 2/6/2018: More Scooby Doo characters available here! Just in time for Halloween, Patrick Pasques at A L'ombre du Pommier has released a paper automata skull. A simple three piece template makes for an easy build. After pressing the skull down to make it grin and reveal its eyes, the "spring loaded" design allows the skull to pop back up. Download the fun here. 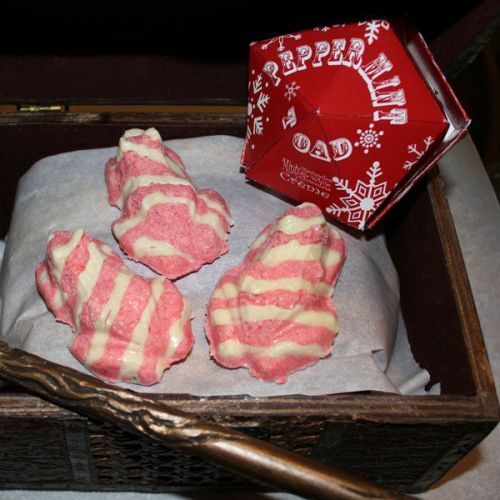 In the world of Harry Potter, a peppermint toad is a magical candy shaped like a toad. After consuming one of the toads it realistically hops in the stomach. The treat is mentioned in A Prisoner of Azkaban as being sold in the Honeydukes sweet shop in the wizarding village of Hogsmeade. The template for this papercraft peppermint toad box is offered by LoneLantern who was also kind enough to include a recipe to create some real candy toads to go inside. Yum! As a company promotion, WindUp Rocket offers a free paper toy version of their logo. 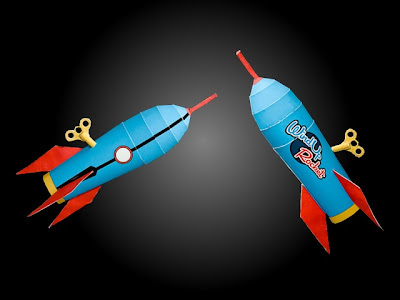 WindUp Rocket is an iPhone and iPad development company with "a passion for beautiful apps". Partnering with the best illustrators and designers around, and employing "generations of wind up toy know-how", the company strives to craft wonderful, delightful applications. 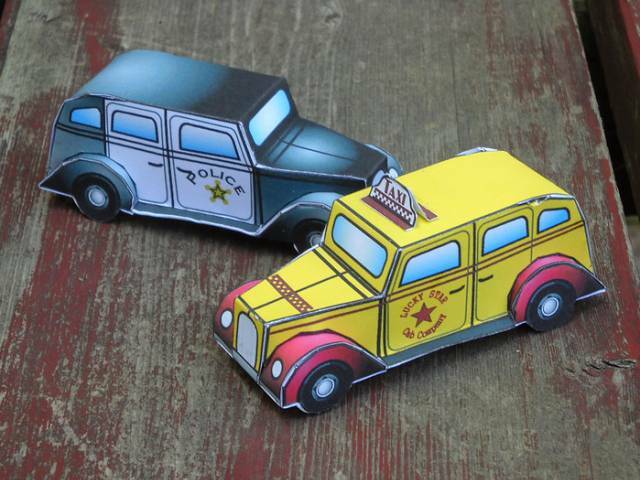 After the Borderlands 2 video game was released in September, it was inevitable that papercraft would follow. ^^ This is the first 3D papercraft from B2 I have seen: the mask worn by Handsome Jack. Jack is the primary bad guy in the game. The task of players is to kill Jack and restore peace to the Earth-like planet of Pandora. 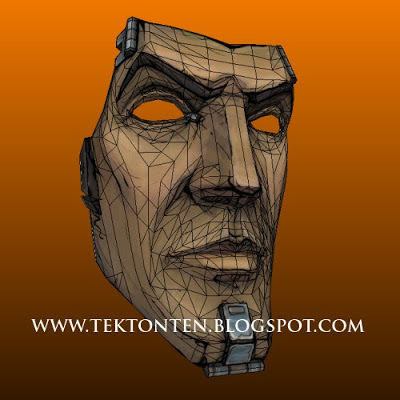 The Pepakura PDO template for the life-size mask was created by botman and may be downloaded here. Previously, I posted some 2D Borderlands 2 masks. The Dodge Viper sports car was first introduced in 1991. The Viper is equipped with an unique V10 engine and is only available with a manual transmission. The fifth generation of the Viper is scheduled for release in the 2013 model year. 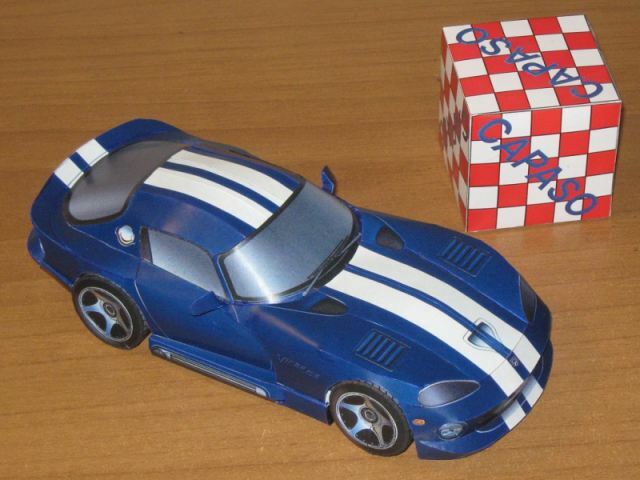 This 1993 papercraft Viper was designed by K. Shinozaki for Daytona magazine. A PDF of the template may be downloaded here. The build photo is by Capaso. Alexandre at origamiemblog.blogspot.com built all nine of my Harry Potter Death Eater masks. I don't believe I have ever seen them all in one photo before! If you missed the masks the first time around there are links to each one below. 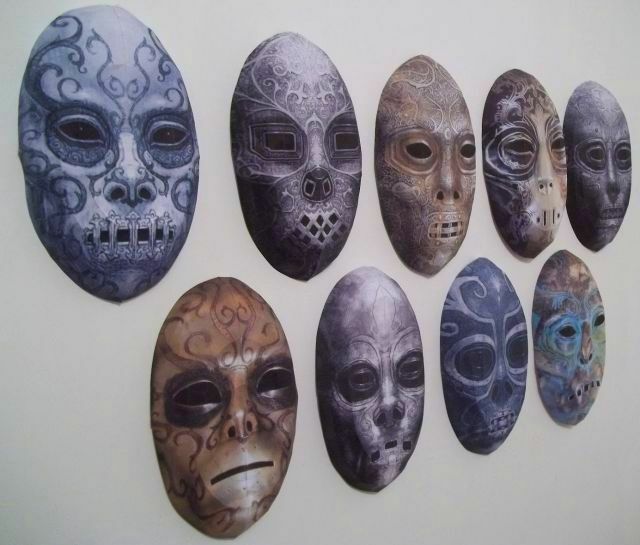 The template of the Death Eater masks was based on a No Face mask I did in 2009. 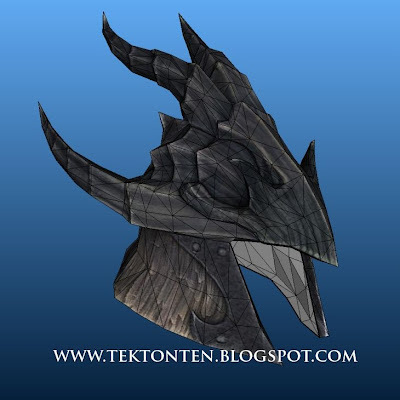 The Dragonscale Helmet is one of the light armor pieces that can be made utilizing the dragon armor perk in The Elder Scrolls V: Skyrim video game. Dragonscale is the strongest light armor in the game. 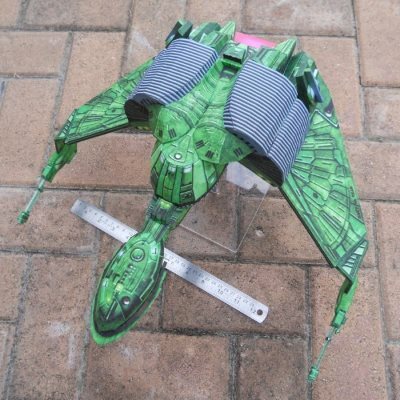 This full scale paper model of the helmet was created by Kuraudo3. 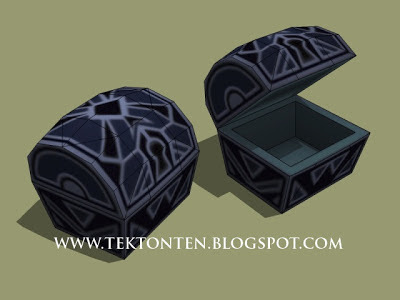 A Pepakura PDO file for it may be requested from Kuraudo3 by contacting him here. For those of you with Mac computers who cannot open PDO files, I have created a PDF file of the template which may be downloaded here. In the Naruto animated series, the character Kakashi Hatake is former member of the Konoha ANBU. The ANBU are a squad that performs special missions such as assassinations and torture. 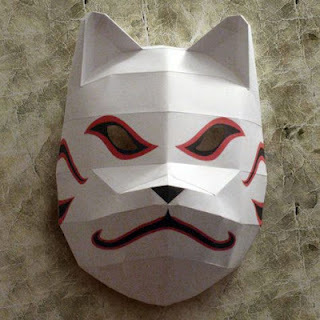 Each of the ANBU wear a porcelain mask to hide their identity. Some of the masks are made to look like animals. Kakashi’s mask is modeled to look like a dog. This papercraft model of Kakashi’s ANBU mask was created by Lyrin-83. The template may be downloaded here. These nifty 1930's style police car and taxi paper models are scaled for use in 25-30 mm scale miniature gaming, but even if you aren't into miniature gaming, they still make pretty cool paper toys. These cars were created by Grendels_Mother64 and the templates for them (and many other cars) may be downloaded here.